Finally got around to playing along with one of SPCC's Finally Friday Challenges. 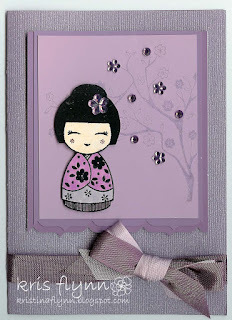 This week the wonderful Robbyn has set the challenge and it is to make a card in Monotone - picking just one colour. So the colour I picked was purple, and okay, her face is flesh colour - but hey I couldn't really make it purple as well!!! I actually used paint swatches for the project - no better way to get monotone that using paint colours - so many different purples to put together. I stamped the tree (Hero Arts K5094) with the Hero Arts Shadow Ink - Soft Lilac - then embossed with clear embossing powder. Coloured the doll from Hero Arts CL297 with purple copics after embossing her in black. Then layered it all together with lovely gems, and put on a Bazzil Bling purple card and used Martha Stewart ribbon in Plum and Hydrangea - an here we are. Wow! This is beautiful. I started to work on mine last night....Great job! Oh my goodness, this is gorgeous! That bow is yummy, and the stamp is adorable! Thanks so much for playing with the monotone challenge Kristina. ahhah you could say it was an alien.. when she had a purple face !! !